Digital Signal Processing with Kernel Methods reviews the milestones in the mixing of classical digital signal processing models and advanced kernel machines statistical learning tools. It explains the fundamental concepts from both fields of machine learning and signal processing so that readers can quickly get up to speed in order to begin developing the concepts and application software in their own research. 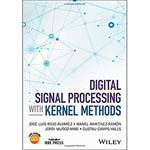 Digital Signal Processing with Kernel Methods provides a comprehensive overview of kernel methods in signal processing, without restriction to any application field. It also offers example applications and detailed benchmarking experiments with real and synthetic datasets throughout. Readers can find further worked examples with Matlab source code on a website developed by the authors. An excellent book for signal processing researchers and practitioners, Digital Signal Processing with Kernel Methods will also appeal to those involved in machine learning and pattern recognition.